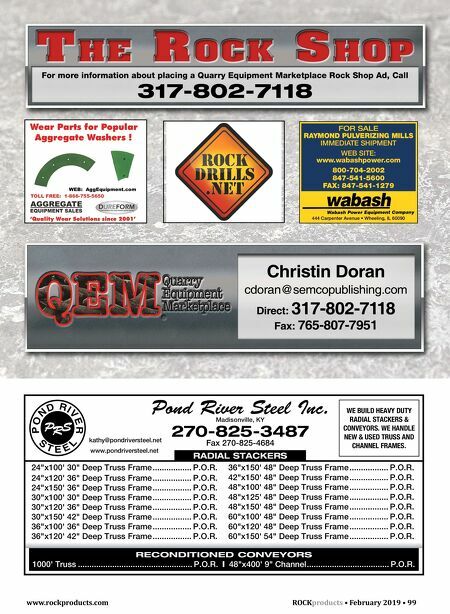 www.rockproducts.com ROCK products • February 2019 • 99 Christin Doran cdoran@semcopublishing.com Direct: 317-802-7118 Fax: 765-807-7951 For more information about placing a Quarry Equipment Marketplace Rock Shop Ad, Call 317-802-7118 Wear Parts for Popular Aggregate Washers ! 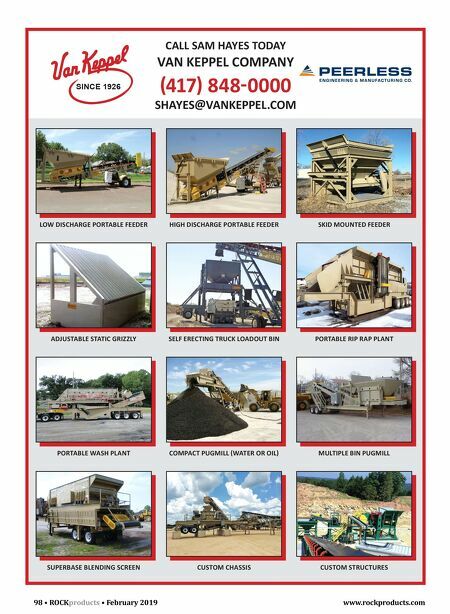 TOLL FREE: 1-866-755-5650 'Quality Wear Solutions since 2001' WEB: AggEquipment.com FOR SALE RAYMOND PULVERIZING MILLS IMMEDIATE SHIPMENT WEB SITE: www.wabashpower.com 800-704-2002 847-541-5600 FAX: 847-541-1279 444 Carpenter Avenue • Wheeling, IL 60090 RADIAL STACKERS 1000' Truss .................................................. P.O.R. 48"x400' 9" Channel .................................... P.O.R. RECONDITIONED CONVEYORS 24"x100' 30" Deep Truss Frame ................. P.O.R. 24"x120' 36" Deep Truss Frame ................. P.O.R. 24"x150' 36" Deep Truss Frame ................. P.O.R. 30"x100' 30" Deep Truss Frame ................. P.O.R. 30"x120' 36" Deep Truss Frame ................. P.O.R. 30"x150' 42" Deep Truss Frame ................. P.O.R. 36"x100' 36" Deep Truss Frame ................. P.O.R. 36"x120' 42" Deep Truss Frame ................. P.O.R. 36"x150' 48" Deep Truss Frame ................. P.O.R. 42"x150' 48" Deep Truss Frame ................. P.O.R. 48"x100' 48" Deep Truss Frame ................. P.O.R. 48"x125' 48" Deep Truss Frame ................. P.O.R. 48"x150' 48" Deep Truss Frame ................. P.O.R. 60"x100' 48" Deep Truss Frame ................. P.O.R. 60"x120' 48" Deep Truss Frame ................. P.O.R. 60"x150' 54" Deep Truss Frame ................. P.O.R. Pond River Steel Inc. Madisonville, KY 270-825-3487 Fax 270-825-4684 www.pondriversteel.net kathy@pondriversteel.net WE BUILD HEAVY DUTY RADIAL STACKERS & CONVEYORS. WE HANDLE NEW & USED TRUSS AND CHANNEL FRAMES.